Sequencing of fungal genomes and systematic genome mining concerning so far undiscovered secondary metabolite (SM) gene clusters have uncovered the great potential of fungal species for SM biosynthesis. Until now, only for relatively few clusters the corresponding metabolites are known. Even less is known about the regulation of their production. However, the latter is crucial to explore the full biosynthesis potential of fungal strains. It can be expected that this knowledge will lead to the discovery of novel drugs. Here, we discuss some of the strategies allowing for the activation of unknown silent SM gene clusters. For example, the application of cultivation conditions simulating the natural environment of fungi led to the discovery of new natural products. 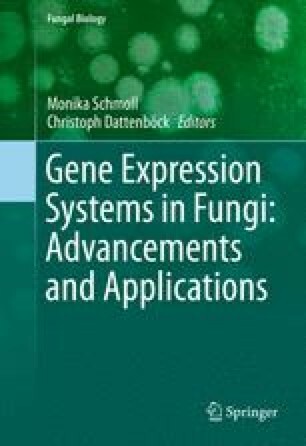 Especially co-cultivation of distinct bacterial and fungal partners often caused the modulation of gene expression and the formation of novel molecules. Interestingly, even the addition of bacterial molecules such as lipopolysaccharide was apparently sufficient to trigger a response of the fungal partner. Another successful approach is to delete, overexpress or inhibit histone-modifying enzymes/genes. In line, approaches targeting histone acetyltransferases led to some new and interesting products. Although these methods allow for activation of silent gene clusters without rationale prediction, they will not help to systematically activate distinct SM clusters in fungal genomes. This problem can be overcome by novel technologies of synthetic biology. One example is the expression of fungal SM gene clusters as polycistronic mRNA that encodes all required pathway-specific genes separated by 2A peptide sequences.